The PIC24 “GA7” family enables portable applications to cut power consumption and board-space while extending battery life in at a fraction of the cost of previous solutions. 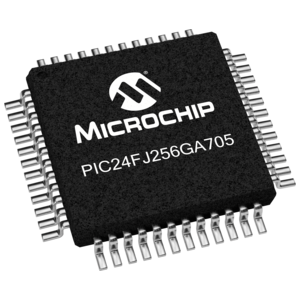 The MCUs integrate up to 256 KB Flash and 16 KB of RAM with core-independent peripherals in package sizes down to 4x4mm. 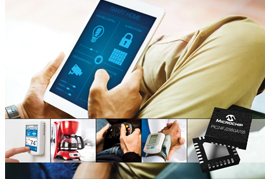 The addition of multiple sleep modes, down to 190 nA, greatly decreases power consumption for applications such as Internet of Things (IoT) sensor nodes, portable medical devices and industrial control. PIC24F 16-bit Microcontroller featuring up to 256KB of ECC Flash and 16KB of RAM. It offers various power down modes to keep the currents very low. It has 12bit ADC at 200ksps with up to 14 analog inputs, 3 comparators and CTMU for touch applications. Available in 28 pin, 44 pin and 48 pin packages. This family is ideally suited for general purpose applications. Find out more about the PIC24 ‘GA7’ family here.